It’s a mighty FINE day over here at BeautyInLagos! *see what I did there*. I just got done interviewing Sam Fine. By the way, thanks everyone that sent in their questions I selected a couple from the bunch and and those served as my interview questions. I also did let him know the questions came from you guys. He was so warm and super-sweet! I shared it all on Snapchat, so checkout my snapchat story quickly before it expires. I will also be sharing excerpts from the interview in a post very soon. 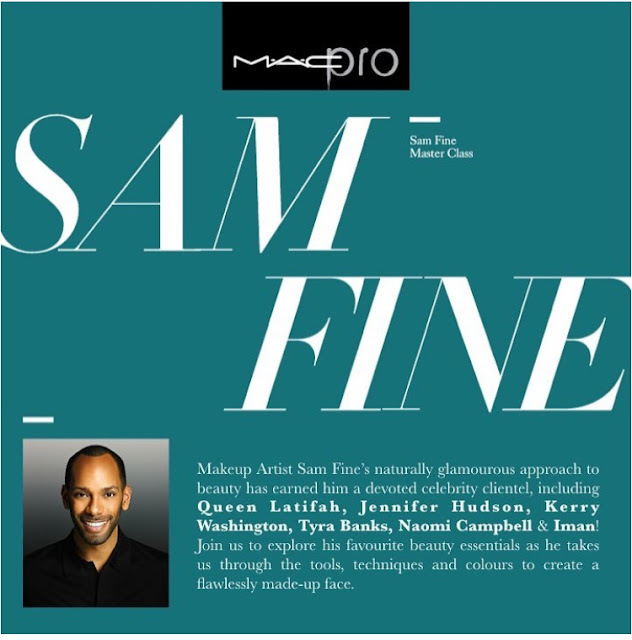 This evening I will be attending a Masterclass by Sam Fine, put together by MAC Nigeria! Super excited to be able to attend this as I missed out on the session he had as part of GTBank Fashion Weekend, because I had to work that day. During this intimate appearance, MAC invites individuals for an upclose and personal demonstration where he sets the record straight on all makeup fundamentals – gracefully grooming eyebrows, creating a flawless foundation, contouring and highlighting, and much, much, more! I honestly can’t wait! Be sure to follow my snapchat all day (Username: BeautyInLagos).